With my total lack of enthusiasm for Friendly's Sundaes To-Go, you might think I don't have any appreciation for store bought Friendly's at all, but this couldn't be further from the truth. To be honest, I don't know why I don't buy Friendly's as much as I use to. We use to buy it a lot in college. In fact, before slow churned, double churned, and cold churned, I fell back on Friendly's Black Raspberry as my "diet" ice cream since it has some of the lowest calorie and fat contents around. Ok, back to reviewing. 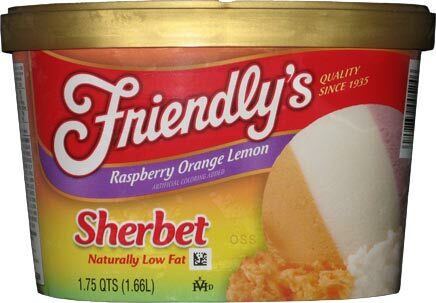 So, over the last week I've been snacking on Friendly's Sherbet. The big problem I have with sherbet is that they always seem to mix the good flavors with the bad and that drives me nuts. Well, Friendly's goes with the interesting trifecta of Raspberry, Lemon, and Orange. I'll admit I was a little afraid, I always am with sherbet, but considering that it was on sale at $2.50 (for 1.75 quarts), I had to go for it. Well, I'm glad I did. The overall nice quality of the sherbet is what I've come to expect from Friendly's. It's not that great real fruit flavor you get with Hola Fruta! but it's still a really nice raspberry sherbet. I'd be plenty happy with just this one flavor. I'm not a huge lemon fan, but it's nice. It's got a good flavor, like a nice glass of lemonade. The orange is pretty much what you might expect from an orange cremecicle. Get a bite of all three together and you won't be disappointed.